Ordinarily when I start a pair of socks, I’m fairly careful about the stitch I pick for the instep and ankles. It has to work with, not compete with, the color. The pattern repeat must divide into the total number of stitches without a remainder. Or, alternately, the pattern repeat should be wide enough that it won’t look weird used on the front and back and combined with a different pattern on the sides. It’s not that hard to figure out… usually. I wanted a feather-and-fan variation for these socks. The one I chose — k2, m1, k1, m1, k2, sl 1, k2tog, psso — worked pretty well with the color in the yarn. I just needed to tweak it a little to make it fit. K2tog on each side instead of the double-decrease used elsewhere across the instep. Yeah… that was the ticket. We’ll come back to that later, gentle reader. I usually plan a little better. I was really happy with the Eye Of Partridge stitch on the heel flaps. You can see a side view at the top of the picture on the left-hand sock, and the whole heel flap on the folded right-hand sock. EOP looks so cool with multi-colored yarns, and fits in with the whole bird theme, dontcha know. So clever of me. Then I finished the heel flaps and it was time to extend that lovely pattern to the back of the legs. Remember how I tweaked the stitch pattern just a bit to make it fit across the instep? There’s this funny thing about decreases: If you want the total number of stitches to remain the same, each decrease must be paired with an increase. That tiny tweak on the sides meant that the increases and decreases were paired and all was right with the world. But, if I knit exactly the same pattern on the back as I was knitting on the front, I would have two double-decreases next to each other on the sides. Ick. You can see it coming can’t you, gentle reader? I got all of the way across the back of the first sock before I realized what was going to happen. The original instep pattern had two stitches decreased over four stitches. I changed that a bit so that two stitches were decreased over three stitches. Twice. And that meant that there were two extra stitches there. I stared at the offending sock in disbelief. Two extra stitches? Why? Oh yeah… I see why. Oh @#$%. Well… that was the least of what I said. I suddenly felt not so clever. Not clever at all. I got out graph paper and started charting. I could either decrease two stitches in the back to make the pattern fit, or I could increase 6 stitches. 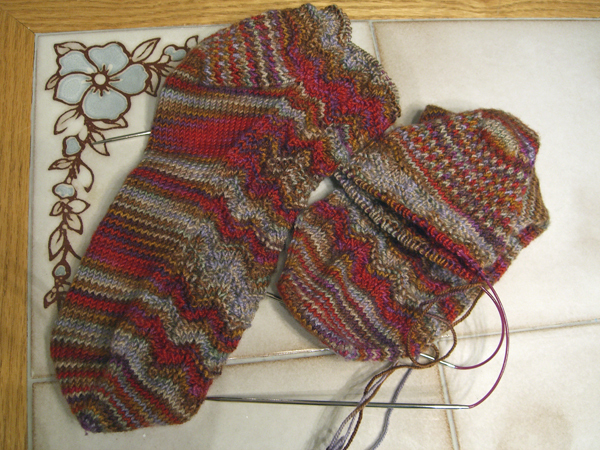 The socks are nicely snug, and there is a wavy pattern, so I elected to increase 6 stitches. I started across the back again, doing a set-up round of increases. I must have been concentrating really hard. Really, really hard. I concentrated soooooo hard on the stitches that, on the second sock, I picked up the wrong needles and started knitting and ended up with this sort of magic loop going on from the fronts of both socks to the back of the left-hand sock, and with the back of the sock on the right hanging by itself on its own needle. I stared at the needles in disbelief. Oh @#$%. That took me awhile to untangle considering that I’d also managed to wrap the yarn several times around the needles between the socks. But I eventually made it around a whole repeat just as it was time to head off for lunch with M and then Saturday knitting at Tangle. There’s this other thing about increasing and decreasing and working on pairs of circular needles: If the increases and decreases aren’t paired on each needle, the needle with more decreases will have fewer and fewer stitches each round, and the needles with more increases will have more and more stitches, and eventually the whole thing will end up rather unbalanced and hard to knit unless one either continuously moves stitches from one needle to the other, or at least moves enough stitches so that the whole thing becomes balanced. I stared at my needles in disbelief. Oh @#$%. I don’t know if my fellow knitsters knew why I was cursing under my breath or not. Perhaps they decided that it was better not to ask. I finally did manage to get a balanced number of stitches on both needles so that I can now happily knit around and around and around and all is right with the world. But I didn’t have much more time to knit this weekend because I did something even more fun than trying to fix my bollixed-up attempt at a nice feather-and-fan variation for my socks. Sigrid — welcome to the rank of Yarn Collectors!